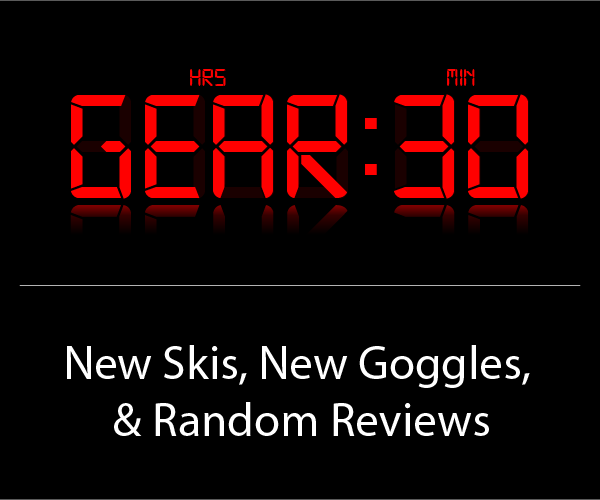 For the 15/16 season, Black Diamond has reshuffled and streamlined their ski line. 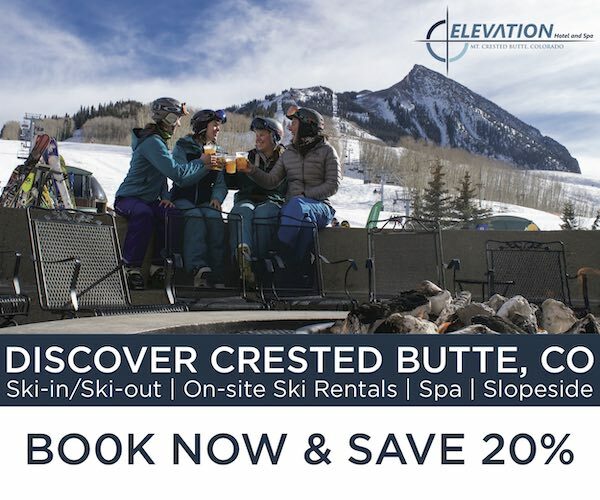 They will be moving forward with three series—the Carbon Series, the Boundary Series, and the Link Series—with three skis in each of those series. The Carbon Series includes the Carbon Megawatt (120mm wide; 178 & 188cm lengths), the Carbon Convert (105mm wide; 164, 172, 180, and 188cm lengths), and the Carbon Aspect (90mm wide; 166, 176, and 186cm lengths). The Link Series features “lightweight designs with a softer flex pattern that’s ideal for backcountry skiing,” and includes the Link 105 (which has the same dimensions and rocker profile as the Carbon Convert); the Link 95 (95mm wide, 164, 172, 180, 188cm lengths), and the Link 90 (you can guess the width; 166, 176, and 186cm lengths. Then there is the Boundary Series, featuring the Boundary 115 (which replaces the Amperage, and comes in lengths of 165, 175, 185 and 195 cms), the Boundary 107 (reviewed here), and the Boundary 100, which comes in lengths of 164, 172, 180, and 188cms. I think this simplification of the Black Diamond line is a very good move. 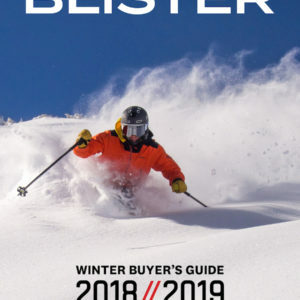 Previously, BD made so many different skis that it was very difficult to keep them all straight, let alone figure out which ski would make the most sense for you. Now, everything is more clear cut. Having said all that, noticeably absent from the line is the Zealot (110mm wide), a ski that (in the 182cm length) I thought was a versatile all-mountain performer, and that reviewer Jason Hutchins thought was an excellent blend of stability and playfulness. So while the Boundary 107 isn’t the Zealot, it is the Zealot’s replacement. In other words, these skis are supposed to work both inbounds and out. The Boundary 107 has a really nice shape that’s pretty reminiscent of the Line Supernatural 108 (there will be more on this comparison as we go). It also has a very nice flex pattern: medium/stiff tails, medium shovels. Not super burly, but certainly solid and consistent. 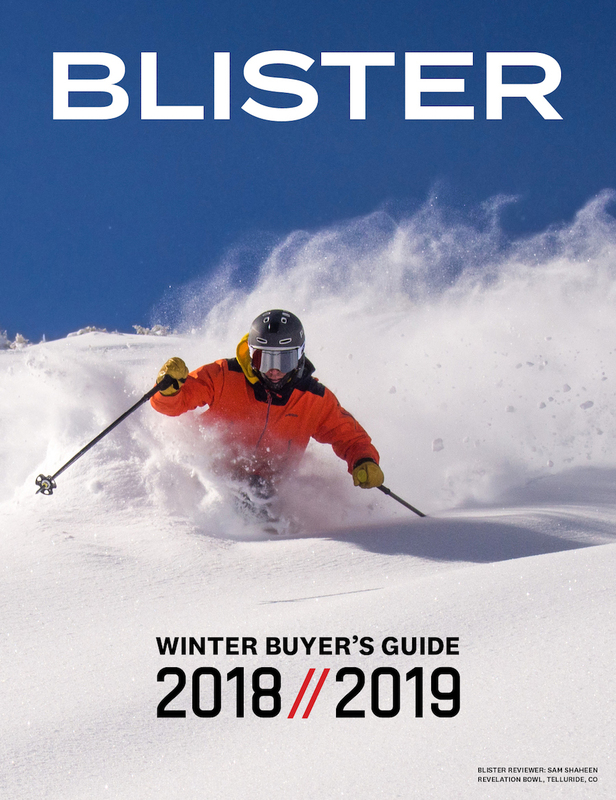 The overall flex of the ski is in the same ballpark as the 14/15 Blizzard Cochise, though the Cochise is just a touch more stout overall, both in the tip and tail. The other notable thing is that the Boundary 107 has a good amount of camber underfoot (about 5mm), roughly double that of the Cochise or the Line Supernatural 108. 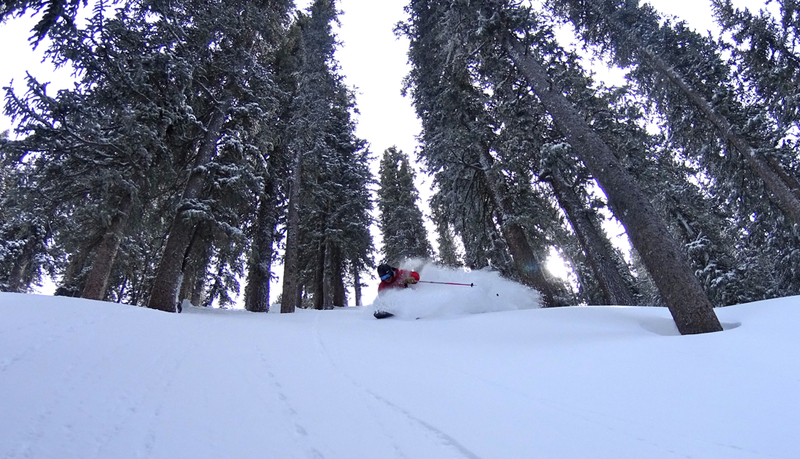 After four days at Taos on this ski, across a broad range of terrain and snow conditions, I’m getting a pretty good handle on this ski. Here’s what I’ve found so far. Black Diamond touts the Boundary 107’s “fun, easy-turning performance in soft snow,” and I’d say that’s fair. It is definitely not the loosest pow ski out there, but the pretty heavily-tapered tips and pretty significant tip splay (for a 107mm ski) make it a good performer in the light, dry, and deep pow I’ve found in pockets on Kachina Peak and West Blitz, as well as the heavier untracked snow I found yesterday around Hunzinker. Jonathan Ellsworth on the Black Diamond Boundary 107, West Blitz, Taos Ski Valley. Black Diamond doesn’t talk about the Boundary 107’s carving performance at all, which I rather appreciate—they’ve positioned this as fun soft-snow ski, and I think it’s fine (and pretty refreshing) for a company to leave it at that, rather than proclaiming that their ski slays everything, all of the time. Still, the shape and camber profile of the Boundary 107 works quite well on groomers—especially smooth groomers. They are not as smooth & energetic as the Best-In-Class Line Supernatural 108, and on roughed-up groomers, I could definitely find their speed limit. But on clean groomers, these carve well, are happy to accommodate high edge angles, and have good edge grip. Before getting on the Boundary 107, I’d been reviewing the Liberty Variant 113 – a burly, heavy ski with a huge top end. So coming from that, very few skis would impress with their performance in variable and chopped conditions. But for someone of my size, at least, in variable and mixed conditions, you will either slow things down in these conditions on the Boundary 107 (and the 107 is happy to do slower speeds / more turns), or you will ski with a very dynamic style. The Boundary 107 does not blow things up. It’s tapered tips, more significant sidecut, and lighter weight make it less of a steamroller than a ski like the Cochise, or even the Line Supernatural 108. (1) I’m curious what a lighter skier (with a lighter skiing style) like Jason Hutchins will think of this ski. Jason was quite pleased with the stability of the 182cm BD Zealot, and I’ll be interested to get his thoughts on the 107. I suspect that he might tout the Boundary 107’s variable performance more than I would. (2) The Boundary 107 also comes in a 192cm length, so if you like what you’re reading about this ski, I would expect to get a variable-performance bump in the 192cm length. So while this is a ski that I have not been able to go really rage around on in mixed conditions, the more I’ve adopted a neutral stance, a lighter style, and a willingness to work with the undulations in the snow and terrain, the better I’ve been able to make this ski work. 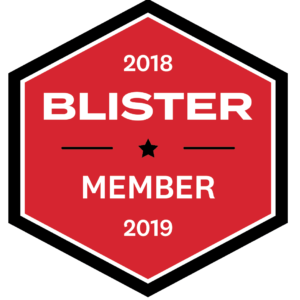 And I suspect that those coming from (and enjoying) skis like the DPS Wailer 112 or the Rossignol Soul 7 will find that the Boundary 107 provides a good bump in stability in tricky conditions. One of the things that impressed me the most about the 182cm Zealot’s performance was how well it handled moguls. So far, I can’t yet say that the Boundary 107 feels quite as natural in bumps as the 182cm Zealot (the Zealot seemed to have a bigger sweet spot than the 107), but in nicer, fairly uniform bump lines, the Boundary 107 is totally acceptable. In weird, gnarly bump lines, I’ve needed to focus more and ski mistake-free. The Supernatural 108 has felt like the more forgiving ski in bumps with the larger sweetspot, which I attribute in part to its having less tip and tail splay than the Boundary 107. That is a good looking ski. Does it prefer a forward stance or is it one of these “new school” centered bs snowblades? It’s definitely not a snowblade, and doesn’t ski especially short – it wasn’t obvious that I would much prefer the 192s, and the only reason I’d be curious would be to see what kind of bump I might be able to get in variable conditions. On good groomers or consistent snow, I could certainly get on the shovels. But in variable terrain & conditions at speed, I haven’t yet felt comfortable getting all over the shovels like I can on the Blizzard Cochise, Moment Belafonte, Supernatural 108, or the Liberty Variant 113. It’s interesting – this is a pretty strong ski, but certainly not some traditional comp ski – for now, at least, I think the best I can do is still position it between the Line Supernatural 108 and the Rossi Soul 7. Would you be able to compare it to the Sidestash or Annex 108 at all? Is this an “intermidiate” ski in the same way as the Rossignol Soul 7? I ski North Island New Zealand and was considering the Soul 7 as a first powder / touring ski but we given the amount of variable snow we get this may suit the conditions better. I’m 180cm / 80kgs and an improving intermediate, would 184cm be the right length for me in the Boundary’s? 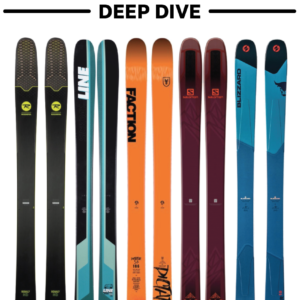 Would you recommend the boundary 107 or the link 105 as a “only ski”? (Mostly used for powder but also on groomers)..
Jonathan, I just bought these skis in 184cm. I like to ski the whole mountain, pop off of everything I can find, and throw shifties a lot. The recommended mounting point seems far back. How far forward from it do you suggest I go? Don’t think it matters all that much, but I’m mounting it with Marker Kingpins.